Bubur Cha Cha is a yam (taro) and sweet potato dessert. 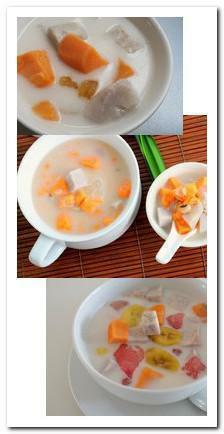 Sweet potato and yam are cut into small cubes and cook in coconut milk. It can be served hot or cold. It is a Nyonya dessert found in Malaysia and Singapore. It is a beautiful and colorful dessert with a very nice texture. * If using brown sugar, the soup will be brown in color. You can have a combination of different colors of sweet potatoes and yams, the dessert will be gorgeous with colorful ingredients. You can omit pandan leaves (screw pine leaves) and sago if you can't get it, but you will lose some good flavors and texture. Boil water in a saucepan. Add sugar, pandan leaves (screw pine leaves) and sago. Stirring until sugar is dissolved. Add potatoes, boil for 5 minutes. Add yams, bring to a boil and reduce heat to low. Stirring occasionally to prevent ingredients stick or burn at the bottom. Simmer until everything is cooked and sago turns translucent. Approximately 15 minutes. Add coconut milk, stir and bring to a boil. Remove from heat, discard pandan leaves (screw pine leaves), serve hot or cold.